On Hassidic Trail in South-Eastern Poland / 7 days /, Jewish heritage tours - discover exciting Poland with us! Your arrival to South-Eastern part of Poland. Transfer to the hotel near Rzeszów with possible visits in first cities on your visit trial: Dębica famous for XVIII-th century synagogue and Ropczyce with its Jewish cemetery. Dinner and overnight stay at your hotel. Breakfast. Departure for the most South-East located area in Poland – Bieszczady mountains. Your first visit place is Rymanów where you see the old synagogue and cemetery dated on XVI-th century. Next city on your Hassidic Trail is Sanok whit one preserved synagogue built in 1924. Afternoon city walk in Lesko includes: old cemetery, the old synagogue and other historic buildings in the city connected with Jews history. Transfer for your accommodation. Dinner and overnight stay at your hotel. Breakfast. Your morning visit in Ustrzyki Dolne – a city settled by Jews from the very beginning in 1509. Next your visit place is Przemyśl. The largest city near Polish – Ukrainian border, famous for two synagogues and cemeteries. Afternoon program shows you Dynów and its cemetery. 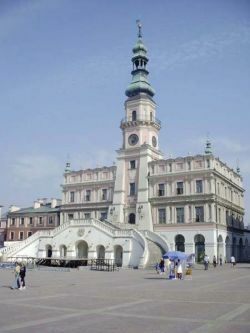 Next transfer to Jarosław – city known as a “national melting-pot” because of three nations living there for centuries. Dinner and overnight stay at your hotel. Breakfast. Morning sightseeing city tour with local guide: the Great Synagogue, Mikvah, Yad Charuzim. Departure for Wielkie Oczy – one of the largest Jews community place in this region, famous for its synagogue. Afternoon visit in Cieszanów, also important place for Jewish community in XIX-th century with its synagogue, houses, cemetery and three associations. Departure for Tomaszów Lubelski for your accommodation with possible break in Bełżec – Museum on the place of former Nazi Concentration Camp. Dinner and overnight stay at your hotel. Breakfast. Departure for Zamość. City with a synagogue, school, mikvah and hospital located on the Jewish Street and a cemetery established outside the town at the beginning of the 17th century was main point for local Jewish population until World War II. Departure for Chełm. City tour of Chełm with local guide: a synagogue from XIX-th century and cemetery. Transfer for your accommodation. Dinner and overnight stay at your hotel. Breakfast and departure for Włodawa, where in XIX-th century Chassidism become popular among the Jews. There were several synagogues and prayer houses in the city until World War II. The Jews community after 1941 lived in ghetto and then all of them were sent to the death camp in Sobibor. Afternoon drive to Kraśnik – city settled by Jews since XVI-th century, nowadays with ruins of the Great Synagogue and a cemetery. Transfer for your accommodation. Farewell diner and overnight stay at your hotel. Breakfast. Departure for Leżajsk, place where Jews came at early XVI- th century. Nowadays a special place for all pilgrimages of Hassidim who come to Chassidic Rabbi Elimelech Lippman’s grave every year. Departure to Cracow or Warsaw for your return flight. Price will be given by e-mail. accommodation (6) at 3 / 4 * hotels in double rooms, breakfasts (6) and dinners (6), local guide services and entrance tickets according to the tour program, all local taxes and portage services. B = breakfast, D= dinner. Price does not include: meals and services not mentioned above, possible tips for driver and tour director. In Rzeszów (160,000 inhabitants) a couple of interesting pieces of the 18th and 19th century architecture stand till today. The parish church dates from the 15th century and the early 17th century Bernardine monastery has sumptuous Baroque interiors. Two synagogues stand east of the town square, one housing an exhibition, the other an archive. The city also has a castle renovated in 19th century opened to visitors. North-east of Rzeszów, the Bernardine monastery in Leżajsk is home to the famous organ dating from 1693, complete with its 5,900 organ-pipes. The 17th century monastery is a work of an Italian master Pellaccini. In Łańcut, to the east of Rzeszów, stands one of the country’s most important magnate residences. The two-storey construction with a courtyard was built in the late 16th century and the magnificent park in the 17th . Its interiors are lavishly furnished and decorated with paintings. Among the buildings in the park are the orangery and a Romantic little castle. The old stable and coach-house buildings are given over to the museum of carriages, containing one of the most exquisite collections of carriages and stagecoaches. A lovely town on The San River, shaped by many cultures. Numerous historic buildings and massive fortyfications that were finally overcome during the World War I. Museum has a large collection of icons. Neighbouring attractions include the palace and grounds at Krasiczyn. Przemyśl, a provinces's capital and an important city, is one of the most attractive center in the south-eastern of Poland in terms of tourism and economy. It is location 12 km frm Polish- Ukrainians border crossing Medyka at the gateway to The Bieszczady Mountains has directed its development strategy towards the town becoming a trade centerand a tourist center. A pearl of Renassaince architecture, centered around an impressive town square. Take in the Town Hall, cathedral and city walls. Check out the public library and you' ll see it was once a synagogue; likewise, the local jazz club is in a mykva (ritual bath) - now a rarity. Close by are the fairy - tale forests of Roztocze National Park, with huge old trees and wild horses.